OnePlus 6T ₹ 37,999 McLaren Edition is now available via Amazon India and the OnePlus website. The latest OnePlus 6T variant sports a Speedmark McLaren brand logo and has top-notch specifications, including 10GB RAM and 256GB of onboard storage. The most premium variant in the entire range, the OnePlus 6T McLaren Edition also has the company’s Warp Charge 30 charging technology. There is a signature Papaya Orange colour wrapped around the borders of the phone. Further, the OnePlus 6T McLaren Edition comes bundled with gifts and redesigned USB cables. The OnePlus 6T McLaren Edition price in India has been set at Rs. 50,999 for the lone 10GB RAM and 256GB onboard storage configuration. The price is notably higher than the 8GB RAM/ 256GB storage variant of the regular OnePlus 6T that was launched at Rs. 45,999. As far as its availability is concerned, the OnePlus 6T McLaren Edition is now on sale via Amazon India and the OnePlus India website. It is also available for offline purchase from OnePlus exclusive offline stores in select cities. 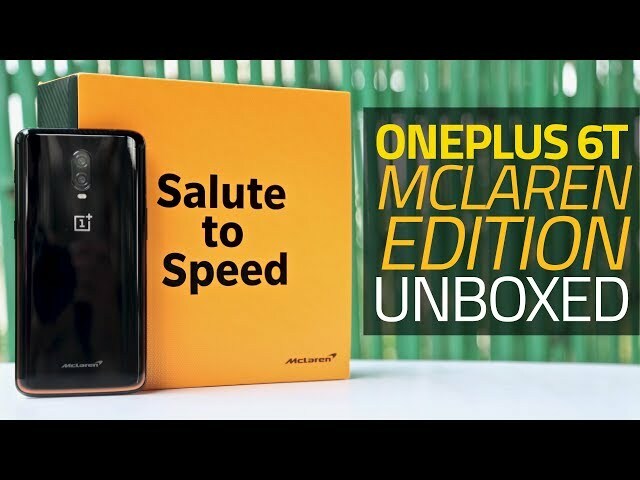 Notably, the OnePlus 6T McLaren Edition went on sale exclusively in a special sale earlier this week at the OnePlus Experience Store in Connaught Place, New Delhi. On the part of launch offers, OnePlus announced that on the occasion of its fifth-anniversary celebrations, offers will be available from December 15 to December 24 on the OnePlus 6T McLaren Edition as well as other OnePlus 6T variants. These offers include Rs. 2,000 cashback on all EMI transactions on Axis Bank cards and Rs. 1,500 cashback on all transactions made using Axis Bank credit or debit cards across all offline and online platforms. Customers purchasing the OnePlus smartphone will also get up to six months no-cost EMI on Amazon.in, Oneplus India, and all OnePlus exclusive offline stores; additional Rs. 3,000 discount on an exchange of any old OnePlus handset; and Rs. 2,000 off on exchange of other devices on Amazon.in, OnePlus India, and all OnePlus exclusive offline stores. The dual-SIM (Nano) OnePlus 6T McLaren Edition runs OxygenOS on top of Android 9.0 Pie and features a 6.41-inch full-HD+ (1080×2340 pixels) AMOLED display with a 19.5:9 aspect ratio and sRGB support. Under the hood, there is an octa-core Qualcomm Snapdragon 845 SoC, coupled with 10GB of LPDDR4x RAM and 256GB of internal storage that is not expandable via microSD card. In terms of optics, the OnePlus 6T McLaren Edition has a dual rear camera setup that includes a 16-megapixel Sony IMX519 primary sensor and a 20-megapixel Sony IMX376K secondary sensor. The camera setup supports 4K video at 60fps, Super Slow Motion video, and dual-LED flash. For selfies, the handset has a 16-megapixel sensor at the front along with an 1-micron pixel size, f/2.0 aperture, and EIS support. The OnePlus 6T McLaren Edition has 4G VoLTE, dual-band Wi-Fi 802.11ac, Bluetooth v5.0, NFC, GPS/ A-GPS, and a USB Type-C (v2.0) port. It has an in-display fingerprint sensor and a software-based Face Unlock feature. The smartphone packs a 3,700mAh battery that supports Warp Charge 30 to offer up to 30W fast charging support for enabling a day’s worth of charge in 20 minutes. Lastly, it measures 157.5×74.8×8.2mm and weighs 185 grams.